A suicide bombing claimed by the Islamic State group hit UAE-trained Yemeni troops in the government bastion of Aden on Tuesday, killing six people — including a child — and wounding dozens. The attack in the north of the port city hit an army mess hall serving the so-called Security Belt brigade, which is supported by government ally the UAE, a security source said. At least six people were confirmed dead, including a young child, and 30 wounded, the source said, adding that they included passers-by. Several cars parked nearby were severely damaged. IS claimed the attack on its propaganda arm Amaq, saying an “act of martyrdom by car bombing” had hit the “main headquarters for food run by the Security Belt which is loyal to the United Arab Emirates, in the area of Dareen in the Mansoura district of Aden”. But it also hosts jihadists of Al-Qaeda and the Islamic State group, who have both claimed attacks in the city in recent years. 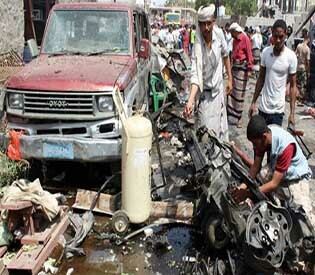 On February 24, twin suicide bombings claimed by IS hit a base of an Aden counter-terrorism unit, killing five people, including a child. The government established its headquarters in Aden, Yemen’s second city, after the rebels forced it out of the capital in 2015. In January, Aden was rocked by deadly clashes that saw southern separatists seize much of the city from other pro-government forces.